Franklin County Will Book B, p 139. Will of William Bolton, Hamilton Twp, written 9 Mar 1795, proven 1 Sep 1802. Wife Sarah to be maintained by son William; son Samuel seven shillings and his eldest son William fifteen pounds; daughter Ann Smith twenty pounds; daughter Mary Bolton to be maintained by son William; daughter Sarah Bolton fifty pounds; son William all my real and personal estate. Exec: Son William and Capt Samuel Patton. Wit: Alexander Speer and Daniel Eckels. Is this family related to the BOLTONs Below? Family lore says: William & Mary were married circa 1800 in Ireland. Soon after their marraige they came to America & settled near Chambersburg, Franklin County, PA. Male BOLTON b. circa 1801, PA. Female BOLTON b. circa 1803, PA.
Sarah BOLTON b. 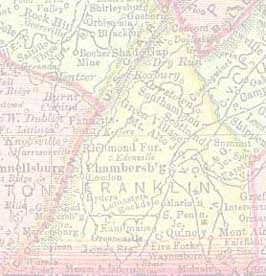 19 Nov 1805, Chambersburg, Franklin Co, PA; m. 03 Jun 1824 in Chambersburg, Franklin Co, PA. to William EDWARDS. Joseph BOLTON b. circa 1807, Chambersburg, Franklin Co, PA.
Susannah BOLTON b. circa 1811, Chambersburg, Franklin Co, PA; d. young in Chambersburg, Franklin Co, PA.
Samuel BOLTON b. 1812, Chambersburg, Franklin Co, PA.
Mary C. BOLTON b. circa 1843, OH. Joseph BOLTON b. circa 1845, OH. Harriet E. BOLTON b. circa 1849, Butler Co, OH. James M. BOLTON b. circa 1852, Butler Co, OH. John BOLTON b. circa 1857, Butler Co, OH. Catherine BOLTON b. circa 1814, Chambersburg, Franklin Co, PA; d. after 1880, IN; m. 17 Sep. 1833, Butler Co. OH to John YOUNG b. circa 1813, d. before 1850, OH. Rebecca E "Beck" YOUNG b. circa 1834, Butler Co. OH, m 21 Dec. 1855, Butler Co. OH to Amasa COHEE. At Rebecca's death in 1867, they had 5 sons. 2). Harry Verne COHEE b. 22 Mar 1884, WY, d. 5 Jan 1955, Imerial Co, CA. 5). Roy COHEE b. circa 1891, NE. 6). Willard. COHEE b. circa 1894, NE. Velma J. COHEE b. circa 1904 NE. 2). Marian COHEE b. Jan 1881, IA. 3). Carl COHEE b. circa 1886, IA. (1930 census living w/ father). 6 - 8) Boy, Girl, Girl COHEE. 3. Eugene COHEE b. circa 1859, Butler Co, OH. 4. Robert A. COHEE b. circa 1861, Butler Co, OH. By 1930 could be living in Hot Springs, Garland Co, Arkansas. 5. Haddeus? COHEE b. circa 1865, Butler Co, OH. William YOUNG b. circa 1836, Butler Co. OH. James YOUNG b circa 1838, Butler Co. OH.